We create the atmosphere for you to do business. 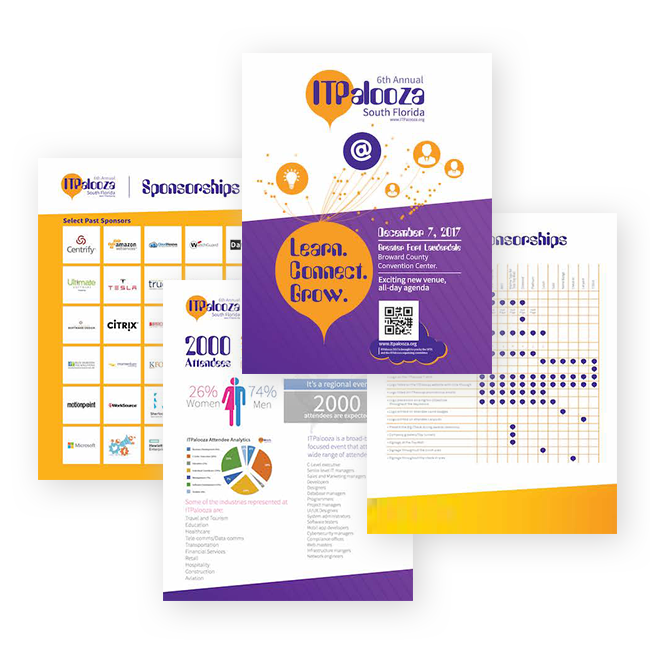 The first thing we should probably mention is that ITPalooza is a really popular event, this means the best opportunities sell first. For example, our premier Keynote address slot is already sold! ITPalooza 2016 was so successful that we sold out the vendor exhibit, sold out the Hiring Fair, sold out the CIO Track, we were over subscribed on every waiting list and we totally blew out the attendance. That’s why ITP17 is moving to the Ft. Lauderdale-Broward County Convention Center where there is parking for 3000 cars, a bigger vendor exhibit area and tonnes more space for visitors to network and enjoy the experience. Get your brand exposed to 2000 local and regional decision makers and technology influencers. Along with the exciting new venue comes an incredible, professionally designed and built vendor exhibit. The exhibit is designed to let vendors present their products and solutions in a bright and open environment that never feels cramped. The exhibit will be easy to navigate with plenty of interest for attendees including the Mega Toy Wall and experience sponsors. Here you will find a number of useful assets to help you and your team select the best package for you companies budget and marketing goal. We currently have 12 sponsorship packages listed, 3 of which are now sold out. If you see something that looks like the right fit, you should act immediately to avoid disappointment.